On January 29th, 2016, Casi and Joey Rott welcomed healthy triplets into the world. The triplets’ two big sisters — Chloe, 6, and Tenley, 2 — couldn’t wait to meet them. Casi quickly recovered after delivering two boys and one girl. But two days after being released from the hospital, she awoke at their Kansas home at 4 a.m. with sharp chest pains and palpitations. 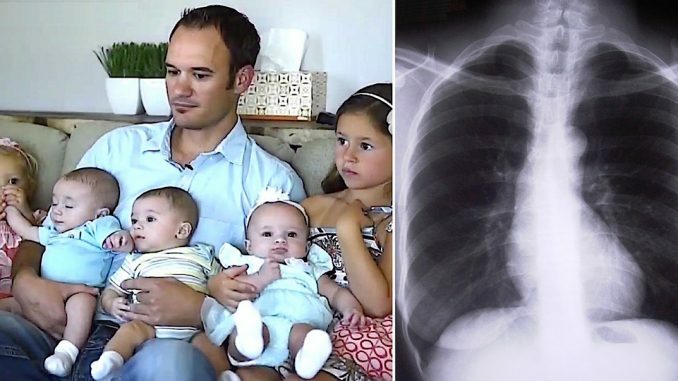 Joey took her to the hospital where a CT scan revealed she had a blood clot in her lungs. Casi was released a couple days later with medication, feeling good. She and Joey were ready to put the health scare behind them and focus on their family. On February 5th, Casi held all three babies in the NICU for the first time. Upon returning home three days later, Casi and Joey spent the morning preparing the triplets’ nursery. Joey picked Chloe and Tenley from school, then Casi spent some quality time with them. Later that day, Casi unexpectedly passed away. In 2004, Casi and Joey met at work and fell in love. Two years later, he proposed. The Kansas couple couldn’t wait to start growing their family, and that’s exactly what they did. In 2015, Casi and Joey Rott learned they were expecting triplets! This meant they would now have five kids all under the age of 7. The triplets’ two big sisters — Chloe, 6, and Tenley, 2 — couldn’t wait to meet them. On January 29th, 2016, Casi delivered healthy triplets, two boys and one girl. She quickly recovered, but two days after being released from the hospital, she awoke e at 4 a.m. with sharp chest pains and palpitations. Joey rushed her to the hospital where doctors discovered she had a blood clot in her lungs. It was likely the clot was caused by the triplets’ pregnancy and C-section. Further tests showed Casi had no other clots, but that her heart was stressed. However, she no longer had symptoms and was cleared to go home. She and Joey were ready to put the health scare behind them and focus on their family. On February 5th, Casi held all three of her triplets in the NICU for the first time. Upon returning home, Casi and Joey spent the morning preparing the triplets’ nursery. Joey picked Chloe and Tenley up from school and the four of them were able to spend time together at home. Joey, Chloe and Tenley will cherish these moments forever. Because later that day, Casi unexpectedly passed away. It was just 10 days after welcoming the miracle triplets that life changed in an instant. Joey was left to raise his five beautiful children as a grieving widower and single father, but thankfully he has the help and support from his loved one. A Gofundme page was set up to raise funds for Joey and his children, which continues to provide extra support. Casi never got to welcome her triplets into her home in Clay Center, Kansas — the old farmhouse she and Joey renovated together. Joey is now adjusting to life with five children. Though he admits it can be pretty tough to balance, Joey is unbelievably strong and continues to figure it out on his own. There have been times when Joey has felt like giving up amongst all the pain and grief. But he has remained defiant for the sake of his older girls and triplets Asher, Levi and Piper. If you’d like to help this family in any way, please visit the Rott’s Gofundme page — and please SHARE this story with your friends on Facebook.